There's no crying in baseball. At least according to Tom Hank's character in the movie, A League Of Their Own, when he made a teammate cry after yelling at her for an ill-thought throw. It's one of my favourite lines from this movie and I quote it every time I don my Peaches uniform. Anyone else love this movie as much as I do? It's so fun and inspiring. I'm always a fan of badass women doing whatever they damn well please. In this case, they damn well played ball. If you haven’t seen this slice of 90’s does 40’s heaven then I recommend you do! It's a fictional telling based on the real Rockford Peaches of the All American Girls Professional Baseball League that operated between 1943 to 1954. Or you can read about the real Rockford Peaches, and the AAGPBL history here. I take inspiration from their sassy attitudes and baseball prowess, and a few Halloween’s ago I took some sewspiration from their uniforms. I made one for myself and one for my bosom buddy. There's no I in team....so naturally I had to round up at least one team member for our weekend adventures. To this day, it's my favourite Halloween costume that I've ever made. I felt awesome and adorable in it, and everyone loved it. AND my favourite part is when people asked "OMG! Where did you get your costumes?! ", I got to answer with a big bright "I made them!!”. Fellow sewers, you know the feeling! 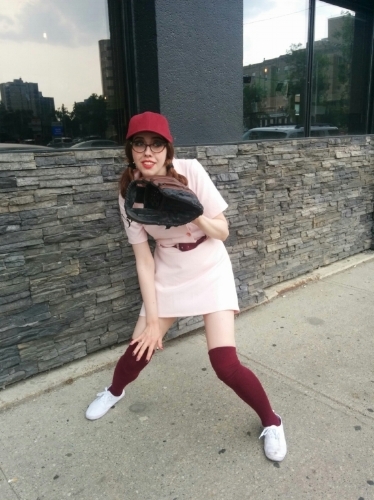 Recently, my friend Katryna (who you may recall from tulle skirt loveliness), took up playing softball for the summer. She reached out to me to inquire about the possibility of getting this very uniform made for their team organizer, Amanda, as a season ending surprise gift. I loved this idea so of course I was happy to oblige. The element of surprise made it all the more exciting! With the help of a fellow teammate, Katryna sneakily acquired some necessary measurements and after a few evenings of pattern adjustments and sewing a fellow Peach was called up! I'm told the uniform fit spot on, too! I’m a total nerd and love the math of pattern making. It’s brain teasing at times but when it all works out it’s so, so satisfying. I used a beautiful peachy pink cotton/spandex twill blend, and some vintage notions to complete the uniform! The buttons are from one of my all time favourite vintage stores, Swish, and the belt buckle was a sweet, practically free, score at our local Reuse centre. And, like any good fabric hoarder, I just happened to have some red twill on hand to sew up a belt and number for the back. Side note, I love making belts! Hammering grommets is an oddly thrilling part of making clothing. The details are my favourite thing about this costume. I was informed that Amanda is a big fan of Dottie Hinson (fictional ball player played by Geena Davis) who wore the number 8. I made a number patch for the back with the help of a perfectly sporty font I found as a free download online. I printed it off and used it as a template. I then used a combination of sew in, and fusible interfacing to give it the weighty feel of an embroidered number. I cut out the “holes” of the number 8 with a sharp exacto knife and then zigzag stitched the patch in place. The Rockford Peaches logo on the front was also self made using t-shirt transfer paper. I know the life cycle of t-shirt transfers are not infinite so I fused this to a separate piece of fabric and appliquéd it on as I did the number on the back. This way, should the transfer ever give out, it would be easy to rip off the old one and replace it with a new one without having any flaky bits stuck to the fabric of the uniform itself. I actually had to do this once already for Chantel’s uniform. But the second transfer turned out much, much crisper so I don’t anticipate it will need replacement anytime soon. The same goes for this newest version. Chantel and I actually have gotten a few uses out of our unis! We wore them to a local Edmonton Prospects game last summer and I’ll definitely be digging it out for future costume parties, Halloween or otherwise. I’m hoping Amanda gets as much joy from this uniform as I do. It was so fun to make and it’s so fun to wear!! I’m very glad I got to make another one, and very thankful to Katryna and her teammates for the commission! It was presented to her at their second last ball game of the season and I'm told she loved it! Welcome to the Peaches girl gang lady! Just remember that cardinal rule….there’s no crying in baseball.